Nora Nunn (center) discusses “wicked problems” in higher ed with her team. Note: This is the second of two posts about the Ed Tech course in the Duke Summer Doctoral Academy. For details about the course, see the first post, written by the instructors. We were a rare group of eight doctoral students: half of us engineers, the other half humanists. It only took two days for us to learn what educational technology is, how to make it, and how to pitch it. In another three days, we designed two apps, tested them, and prepared pitches for a panel of experts. In 12 minutes, we convinced said panel that our apps were not only well-designed, but worth investing in as a potentially game-changing addition to undergraduate education at Duke. 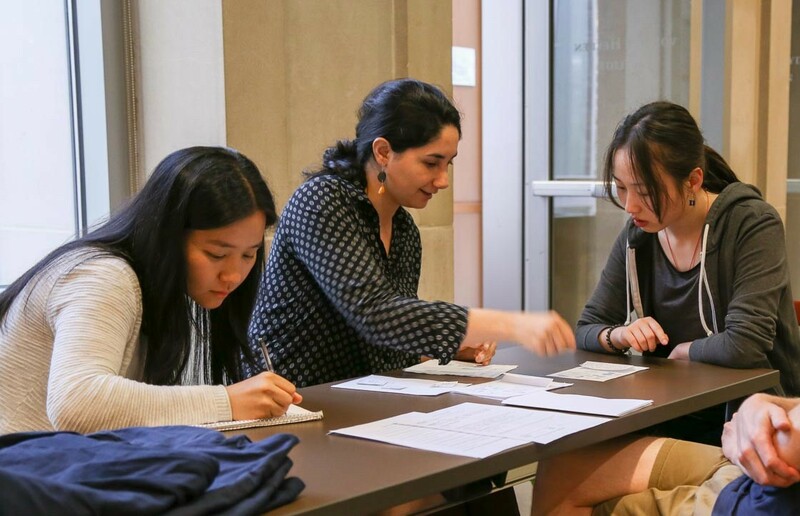 This extraordinary opportunity was the Ed Tech class, part of the Duke Summer Doctoral Academy (DSDA), a new program created as part of Duke’s academic strategic plan. 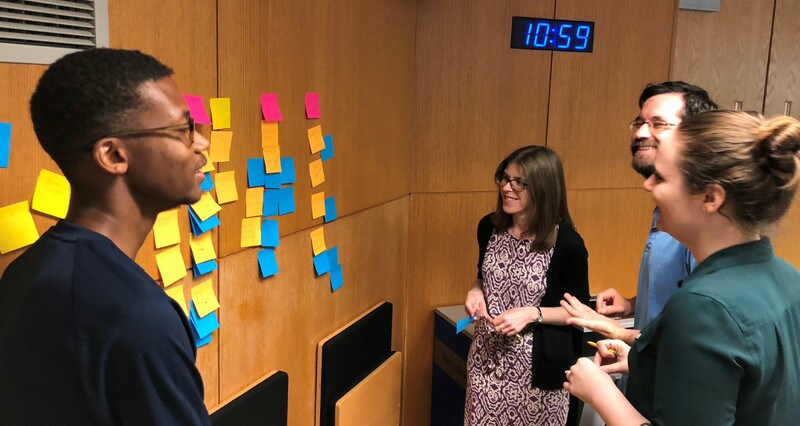 The weeklong class was taught by Matthew Rascoff, Duke’s Associate Vice Provost for Digital Education and Innovation, and Aria Chernik, Director of Open Source Pedagogy, Research + Innovation, and it focused on the intersections of education, engineering, and design thinking. The DSDA’s week-long short-courses are “designed to introduce doctoral students to skills, tools, and knowledge that augment their regular coursework and help them prepare for dissertation research, innovative teaching, leadership, and/or public engagement.” More importantly, it allows for the type of interdisciplinary training that pulls students out of their comfort zones and teaches them complementary skills. Courses included Launching and Scaling a Business, Digital Modeling and Fabrication, Teaching Through the Archives, and Research Computing. In Ed Tech, we reflected on educational problems that find their way across disciplinary boundaries. As doctoral candidate in the humanities, we were interested in (1) becoming more involved in the university and undergraduate education as educators ourselves, and (2) seeing how our comparative advantages would apply to new sorts of intellectual challenges. Although Nora had heard about the class’s primary methodology, design thinking, this was her first hands-on introduction to the practice. Her familiarity with Bill Burnett and Dave Evans’ book Designing Your Life, which she had first heard about on the NPR podcast Hidden Brain, intrigued her and inspired her to sign up for the class. As a former designer and social scientist, Torang was already somewhat familiar with design thinking and UX. She understood the methodology as efficient, streamlined, and accessible for those involved in designing and developing digital products. Earlier in the year, she had been offered an internship with the City of Austin, where user-experience (UX) researchers were applying design thinking to government operations. This class, however, was her first exposure to design thinking and UX in the context of higher education. When the instructors mentioned the possibility of further training in educational technologies at Duke, we decided to do a bit more research. Ed tech is an interdisciplinary field that encompasses design, engineering, education, and learning theories. In bringing the corporate techniques of product development and marketing to the university, ed tech tries to solve real and imagined problems in education with digital resources and platforms. While administrations have eagerly embraced it, many educators remain skeptical if not highly critical. Lee Vinsel, a historian and professor of science, technology, and society at Virginia Tech, has pulled together the many critiques of “innovation” and “design thinking” in education. As Vinsel discusses in a popular article, “Design Thinking is a Boondoggle,“ many designers and educators view these trends as over-promising at best and frivolous distractions at worst. The Stanford d.school defines design thinking as “a process to stimulate innovation, drawing on methods from engineering and design and combining them with ideas from the arts, social sciences, and the business world.” To many, design thinking represents little more than an over-simplified version of social scientific research, without sufficient empathy and rigor. Good social scientists develop empathy through years of acquiring knowledge about communities from different times and places, gaining a deep understanding of human behavior through studying both human history and contemporary human societies. They also acquire analytical sophistication through years of multi-methods research training. One difference between anthropologists and design thinkers, for example, is that the former understand ethnography as requiring at least 18 months of full-time, intensive immersion, while the latter define it as in-context observation, watching users engage a prototype or product for a few hours at most. In contemplating and experiencing the field of design thinking, we can deny neither the apt criticism nor the fantastic interdisciplinary accomplishments of our collaborative course. As a simplification of the technical and the analytic, design thinking acted as a middle ground on which we could both meet and depart, both start thinking and continue working. It condensed the design process into simple tasks that allowed each of us to contribute our unique skills to the team. While we may not become design thinkers or go on to design apps, we still gained valuable lessons with direct implications for our experience as humanist Ph.D.s. First, collaboration may lead to unexpected and exciting results through the happy collision of different perspectives. Though many of us work primarily in solitude, researching and writing on our own, we can still share our ideas in communal settings such as writing groups. We don’t have to work in echo chambers, and by occasionally joining with others, our ideas may ricochet off each other in unexpected ways. Torang Asadi (center) brainstorms with her design team. Second, an openness to fail early, and often, brings huge benefits. This motto, shared with us by invited Duke UX experts Michael Greene and Lauren Hirsh, had special resonance. Sharing one’s work with others and getting feedback in early stages helps to alleviate performance anxiety and provides new perspectives that can enrich your research. Things that you may have taken for granted may turn out to be big questions—or that paragraph you think reads smoothly turns out be, in the eyes of another, a mess. Conversely, the intro section of your dissertation that you see as chaotic may not be as bumpy as you thought. Third, teams benefit greatly from access to complementary expertise and skills. In fact, we each have a unique repertoire of skills that allows us to contribute to any team. This was an important lesson for us, since it allowed us to more effectively consider our own advantages as candidates in different fields. With good reasons, Duke often touts itself as a leader in interdisciplinary inquiry. This class was a perfect example of the advantages of collaborating across disciplines. Technical and analytical skills came together productively: Debates between historians and biologists, literary scholars and computer scientists, and anthropologists and engineers consistently proved fruitful in cultivating solutions to problems. While conversations frequently focus on what STEM fields can offer the humanities, it’s also a two-way street: Humanistic inquiry can enrich the work of others. And finally, in the spirit of collaborative efforts, we have embraced this chance to co-write a blog posting and think about ways of making our data—manuscripts, interviews, texts, surveys, etc.—shareable. To paraphrase our colleague, it helps us to see something new. —Nora Nunn is a Ph.D. candidate in English. Torang Asadi is a Ph.D. candidate in the Graduate Program in Religion.